Here's Gerald Gradwohl showing some serious chops over a heapin' helpin' of Porkpie in Bucharest, Romania. Fans of players like Krantz, Henderson, Landau, Stern and Big Jeff are sure to dig Gradwohl, who has worked with the best of 'em hailing from the legendary Tangerine Dream band. 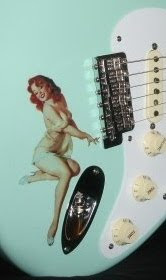 Fine Strat tones are hot & heavy as ever in Europe! One of his albums Tritone Barrier features guest Scott Henderson on the scorching tune "Jeff's Back". Also check out "Praise" from that release. The latest album "Sally Beth Roe" includes a cool SRV tribute you need to check out. Gradwohl is a must for progressive blues fusion Strat freaks-- you know who you are.